The 2016 vintage has been rated 4-star according to 150 users opinion. 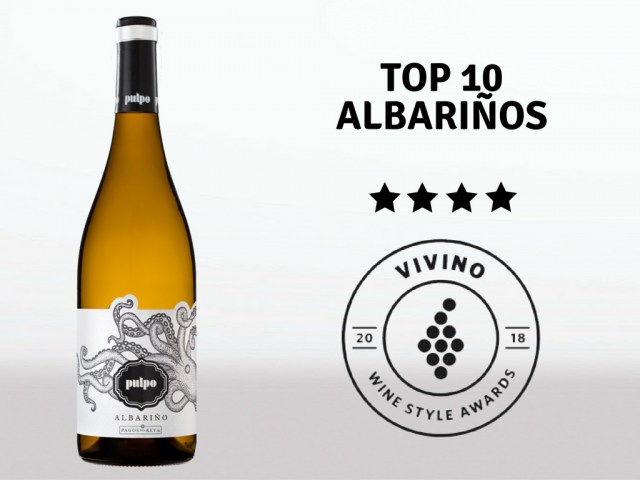 The largest community of wine lovers in the world, Vivino, has awarded Pulpo DO Rías Baixas of Pagos del Rey as one of the 10 Best World’s Best Albariños at the annual ranking Vivino’s Style Awards 2018. Pulpo 2016 has received 150 opinions during the last 12 months with an average rating of 4 stars (out of 5 stars) by the active followers of the Vivino mobile application which account up to 26 million wine lovers from around the world. The value of this award lies on the fact that is the only wine competition were judges are wine lovers. Their sole ambition is the desire to discover new wines and share styles and trends with the community. In the words of CEO and founder, Heini Zachariassen, the way the wines are evaluated denote a democratization of the sector and it is a priceless tool to recognize the market trends. In this edition Vivino’s Style Awards 2018 has evaluated 1,490 wines in 149 different categories divided by countries. Thanks to this recognition Pagos del Rey belongs to the exclusive club of the 1 percent wineries enrolled in Vivino and having one of their wines among the top rated in a category. Pulpo is made in “Val do Salnés” (Galicia) were the largest area of vineyards and wineries of Rías Baixas Designation of Origin is located. A bright wine, pale lemon in colour with hints of apple green, Pulpo´s aromas of white flowers, peaches and apricots lead to a fresh, fruity palate and an enjoyable finish.